Convection ovens cook food by circulating hot air throughout the oven chamber with a fan. This technique allows items to cook at lower temperatures and in less time than in a traditional oven. In the case of a whole turkey, it should take about seven minutes per pound for the bird to cook completely when the oven is set to 375 degrees Fahrenheit. For example, a 15-pound turkey would take about 105 minutes to cook. 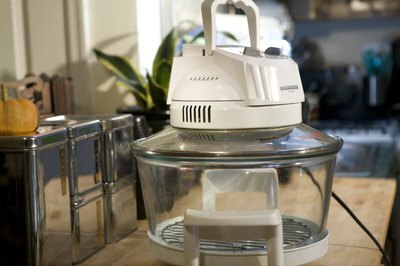 To maximize the effect of the convection oven, the turkey needs to be prepared properly. 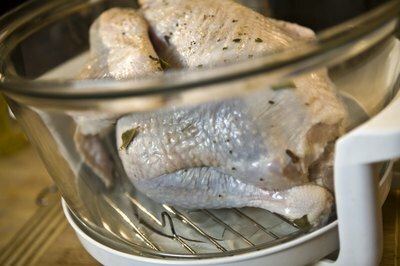 Because convection ovens cook food so efficiently, there's really no need to marinate the turkey beforehand. Simply thaw it completely, allow it to come to room temperature and brush the skin with melted butter or olive oil. Season it with a few pinches of salt and pepper and arrange the turkey on a V-shaped roasting rack. A roasting rack is ideal to use in a convection oven because its low sides allow the hot air to circulate around the entire bird. Preheat the convection oven to 375 degrees Fahrenheit, then select the "roast" setting, if available, as that will allow you to keep the cooking time down. Slide the prepared turkey into the oven. 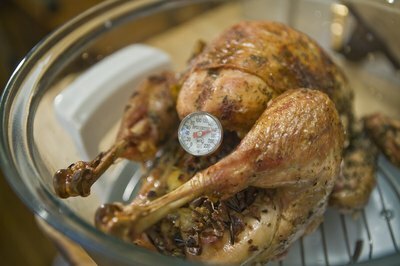 After 45 minutes, baste the turkey with 1/2 cup of chicken stock. Allow the turkey to continue cooking, basting it every 20 minutes or so with pan drippings, until it reaches the end of the cooking time you calculated based on its weight. Test a thigh with a meat thermometer; if the internal temperature registers at 165 degrees Fahrenheit, the meat is ready.